I started looking for a small infrared space heater when our basement reached sub-zero temperatures. I wanted a small yet effective heater to bring pleasant warmth to the room, without much increasing my heating bills. While researching I found that a small infrared space heater is the most cost-effective and energy-saving way to heat a small space in your home. Zone heating through infrared heaters allows you to not only heat the air in the room but every living object in it – for an affordable price. (In fact, I’ve calculated how much an infrared heater is going to cost me: about 21 cents per hour). This little guide is going to help you save a lot of time and some money (because I’ll point you to the best price right now) and I hope you find it useful. 4 Are Infrared Heaters SAFE? Size 12.4" x 7.5" x 13.5"
Size 8" x 13" x 13"
The Dr. Infrared portable (with wheels!) space heater (with a dual heating system: infrared quartz tube + PTC) has a very nice wood finish and is perfect for any small to medium room. The heater’s auto temperature ranges from 50 to 86 degrees and can warm a 1000 square feet relatively fast while being perfectly safe for kids and pets. It has three power settings: Auto, Low 1000W and High 1500W. Built to last 80,000 hours in operation. Not very lightweight – 23 lbs. 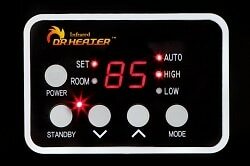 In conclusion, the Dr. Infrared heater is pretty much what I was looking for. It heats the space I wanted it for perfectly. It’s easy to adjust the temperature and its good looks don’t detract from the rest of my furniture. The Ryzen H-5000 infrared heater is a smaller, lighter heater with 3 heating elements (infrared + ceramic PTC) and an Eco setting that can heat smaller spaces to 68 degrees using only 750-Watt. There are 3 energy saving settings and a large remote control to operate the digital thermostat. Temperatures can be set from a range of 59 degrees F to 86 degrees. Lightweight and easy to carry around from room to room. Dual timer setting that can be used to turn on or off up to 12 hours ahead. 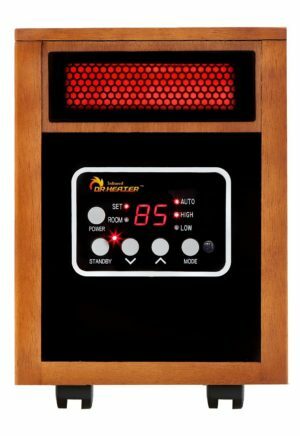 Inexpensive – about half the price of the Dr. Infrared heater. Can be left on 24/7 and run as needed by its own thermostat. 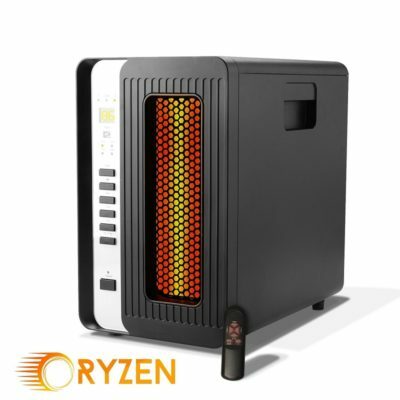 👉In conclusion, the Ryzen H-5000 is an efficient little heater that doesn’t take a lot of space and is safe around children and pets, for an affordable price. The Lifesmart infrared heater (with 3 infrared heating elements) is the most lightweight heater I’ve found (weighs only 11 pounds). The new model has a digital remote control with backlit LCD screen, and there are 3 heat settings – high, low and eco. The unit “remembers” the temperature and mode (high/low/eco setting) when turning the unit off. You can just turn it on and it heats with your previous settings. 3 energy savings settings including an eco-setting that will heat smaller areas to 68 degrees using only 500-Watt. The fan inside can be a bit noisy if you are right next to it. 👉In conclusion, the Lifesmart infrared heater is a compact and smart infrared heater which is safe and works very well. It’s quiet, the exterior stays cool, and it heats fast. 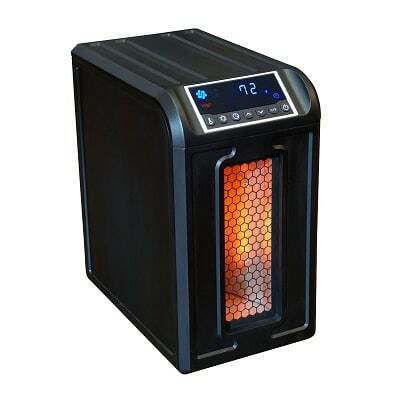 Through our research, the best small portable infrared heater is the Dr. Infrared Heater. It really makes a room toasty warm and you can really feel and see it working. It blends nicely with furniture and is energy efficient. 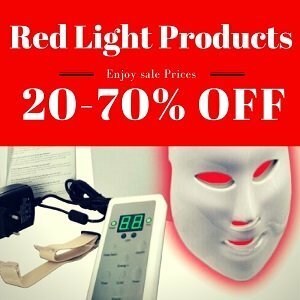 When I check this page, I sometimes find a great sale for it. If you find it for less than $100 – it’s a great deal. 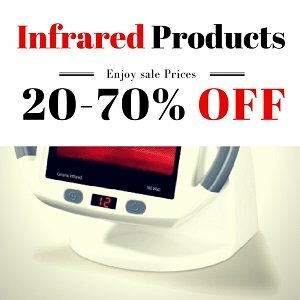 I hope my research has helped you and saved you some money and a lot of time finding the best small infrared space heaters for your needs. Infrared heaters warm you by radiating infrared rays rather than convection of hot air. Some people get concerned when they hear the word “radiation”, and immediately link it to cancer. There is potentially harmful radiation, and there’s harmless radiation. Infrared heat low -energy and non-ionising radiation – which is harmless and does not affect the DNA. Infrared radiation is a natural form of heating. You feel when you get in your car after it’s been out in the sun. The sun radiates infrared energy and this is absorbed by our bodies and promotes blood circulation. All of us emit infrared heat all the time. When you and your spouse hug – you both absorb infrared radiation from one another.